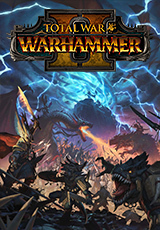 Total War: WARHAMMER II is the second part of the trilogy, the beginning of which was laid by the cult game Total War: WARHAMMER. In it, players expect a new exciting campaign "Great Whirlwind", which takes place on the vast continents of Lustria, Ulthuan, Naggaroth and the Southern Lands. With the development of the plot, its action becomes more and more tense, in the end to come to an epic ending, similar to which there was not yet a series of Total War. The player will enter the role of one of the eight legendary lords, who lead four cultic races of the world of Warhammer Fantasy Battles. To stabilize or finally destroy the Great Whirlwind, he will need to perform a series of magical rituals and to stop all attempts by rivals to do the same. For all the legendary lords there are unique starting positions, and each of the four races has its own style of play, campaign mechanics, the plot, military traditions, armies, monsters, schools of magic and legendary characters. Some of the new units can even carry out massive bombardment of the battlefield.